The Golden Gate Bridge is probably the most historic bridge in the entire United States of America . If it's not, then it is certainly in that conversation. It is located in California and spans one of the most used waterways in the entire country. It is a symbol of class, history and tradition and this is primarily why it was also the inspiration behind the creation of the Golden Gate Hotel & Casino. 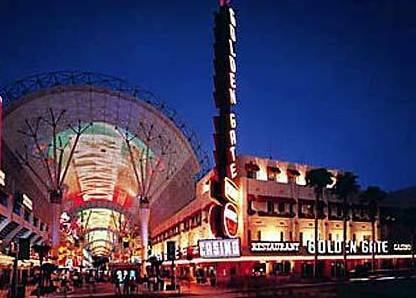 The Golden Gate Casino is located along Freemont Street . Freemont Street runs parallel to the famous Las Vegas Strip and is one major road west of that particular part of the city. This means that it is still within walking distance of everything along the strip while at the same time being far enough away that the people sleeping at night are not subjected to the same amount of noise that they would be were they in a resort located on the strip. This is arguably the best position in Las Vegas to be in and objectively is a good position no matter how you slice it. While the Golden Gate Casino is not a big casino in comparison to some of the monsters that inhabit the strip, it is still a casino that has a lot to offer. For example, they have all of the excellent table games like blackjack, roulette, craps and baccarat as well as a couple of obscure games like a house version of Texas Hold ‘Em. You don't have a lot of choice, but what is there is definitely top notch. The slot machine seems like it was made for the Golden Gate Casino and indeed slots are the specialty of the house. There are 300 different slot machines available for you to choose from, comprising progressive jackpots, reel slots and video slot machines as well. There are many popular variants like Wheel of Fortune and Monopoly as well as some new and hot upcoming slot machines like Da Vinci Diamonds. Slot machine gaming is certainly at its best inside the Golden Gate Casino. The Golden Gate Casino is not a large establishment, a fact that can be seen quite easily with the low availability of tables and slots in the grand numerical sense. Another way in which this can be witnessed is that the Golden Gate Casino does not have a poker room or a sportsbook, meaning that you will have to walk to nearby casinos in order to get those things if you want them. The main extra at Golden Gate Casino is Club 1906 which allows you to win free stuff through playing at the tables or slot machines of the casino. In addition to that, there are also free drinks available. The main drawback to the Golden Gate Casino is its size and that small size prevents a lot of choice from happening. However, what is present is absolutely world class and that is why the casino is still able to draw large crowds day after day.